DAMASCUS, Syria – A suicide bomber blew himself up near the headquarters of Syria’s Greek Orthodox Church in Damascus’ Old City, killing at least four people Thursday, minutes after the patriarch had entered the cathedral, state-run TV and a church official said. The blast in the ancient quarter of narrow streets and historic buildings was the first reported suicide attack of the Syrian civil war inside the Old City, although other such bombs have struck the capital of Damascus. The blast struck near the Virgin Mary Cathedral in the predominantly Christian neighborhood of Bab Sharqi, the broadcast said, although it was not clear if the church was the attacker’s target. Several people also were wounded, the TV said. SANA, Syria’s state-run news agency, said a nearby clinic run by a Muslim charity appeared to be the target. That was also the view of Bishop Ghattas Hazim, who spoke to The Associated Press from Lebanon. Lebanon’s Al-Mayadeen TV, which has reporters in Damascus, said the target of the attack appeared to be a nearby post of the National Defense Forces, a paramilitary force fighting the rebels who are trying to topple President Bashar Assad. Residents also disagreed about the target, with some saying the bomber may have detonated the explosives prematurely. Pro-government gunmen were seen roaming the streets afterward. 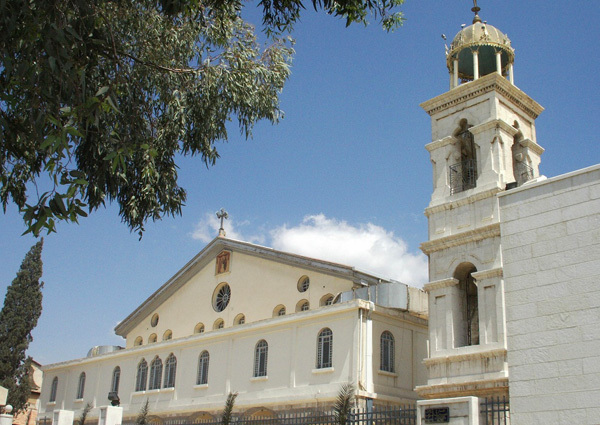 The blast occurred nearly 15 minutes after John Yazigi, the Eastern Orthodox Patriarch of Antioch and All the East, entered the church, but he was unhurt, according to Hazim, an aide. The Britain-based Syrian Observatory for Human Rights estimated this week that more than 100,000 people have been killed since the start of the conflict more than two years ago. It began with peaceful protests against Assad’s rule, then became an armed conflict after the regime used the army to crack down on dissent and some opposition supporters took up weapons to fight back. Churches have been targeted before in the civil war, mostly in the central city of Homs and Syria’s largest city of Aleppo in the north. Yazigi divides his time between Damascus and the Balamand Monastery in northern Lebanon. Yazigi took the post of patriarch earlier this year replacing Ignatius Hazim, who died in December.